Mini Challenge #3: Women of the Otherworld! Passionately Pintrest: Newspaper Text on Nails! Dirty Little Secrets-heating things up! Dirty Little Secret- the Strip! 18 & Over- Chick Fight! 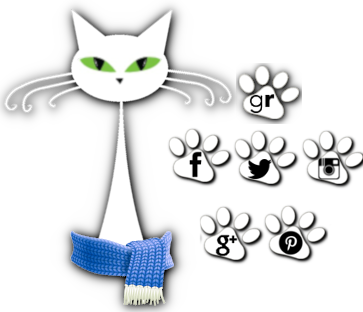 18 & Over Book Blogger Follow- "readcation"
Feature & Follow Giveaway Hop! Welcome to Fool's Gold, California, a charming community in the foothills of the Sierra Nevada. There's lots to do and plenty of people to meet, especially women. Because there's just one tiny problem in Fool's Gold: the men don't seem to stick around. Maybe it's the lure of big-city life, or maybe it's plain old bad luck, but regardless of the reason, the problem has to be fixed, fast. And Charity Jones may be just the city planner to do it. Charity's nomadic childhood has left her itching to settle down, and she immediately falls in love with all the storybook town has to offer--everything, that is, except its sexiest and most famous resident, former world-class cyclist Josh Golden. With her long list of romantic disasters, she's not about to take a chance on another bad boy, even if everyone else thinks he's perfect just the way he is. But maybe that's just what he needs--someone who knows the value of his flaws. Someone who knows that he's just "chasing perfect. Love the cover on this one! 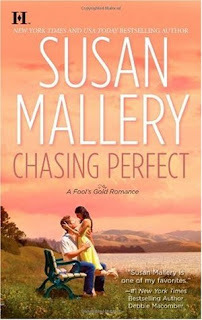 Really all of the covers in this series are lovely and make me want to sigh just a little.Chasing Perfect is a light, quick read and perfect for when you have a bit of down time and want something nice and easy. The set up is pretty unique. Charity Jones is new to the small town of Fool's Gold and it's her job to deal with one of their biggest problems....a man shortage! Seriously. ::smirk:: Love that! While getting settled into her new life Charity's path keeps crossing with town heartthrob and resident bad boy Josh Golden. He's exactly the type of man she's trying to avoid so of course the sparks fly. Even though Charity and Josh seem like complete opposites, she's a quiet city planner and he's a famous cyclist, they complimented each other very nicely. I liked the easy/comfortable way the two related and supported each other while working through baggage from their pasts. There were some awkward relationship moments but even those felt right somehow. "I ran out on Marsha. I have to say something to her. Explain." "She knows you were overwhelmed. That's why she called me." "The brilliant and hunky guy who will distract you." Charity managed a smile. "Oh, right. Sill me." Loved that Charity and Josh weren't joined at the hip and we got to see them in their own worlds and not just as a couple. It brought in a nice element with Charity getting to know the other women in town and creating friendships with them. I'm looking forward to seeing some of their stories later on. And then there was Josh who is struggling to overcome his fear of racing after being part of a tragic accident years earlier. Charity is there to support him but we also get to see him working through it on his own. Those were some of my favorite moments in the book. I loved watching him overcome his panic and gain faith in himself again. It was just heart-breakingly sweet to see his triumphs along the way and finally realize that the people in the town really loved him regardless of if he was able to race again. One thing I wasn't all that wild about were the secondary storylines. 1) the town's man shortage being researched by a college student and 2) the theft of a huge chunk of the town's money. They really didn't add anything to the overall story and ended up feeling underdeveloped and just unnecessary. Background noise that left me wondering what the point was. Eh. Overall I enjoyed Chasing Perfect but will say that it ended up missing that magical spark for me. You know that little spark that has you deliciously tingly, completely captivated and knowing your reading world has been completely rocked. That's not a terrible thing though. Like I said it was a nice, sweet read and one I enjoyed. Sometimes you just need that quick easy break and this was perfect for that. How do you feel about those middle of the road books? The ones that are pleasant and enjoyable but not all that life altering? Would you rather skip over them or do you like the nice little break they provide? First of all, I know this is one of my mother's favorite series, but I've never read it. Contemporary romance...I'm picky about it. I don't know why. Secondly, I try to skip books if I'm pretty sure from the start that they're going to be average (unless they are part of a series) because, holy hell, it is hard to review them. Great books are easy to rave about, bad books are easy to rant about, but reviewing average books is like trying to describe your breakfast cereal. I never know what to say. A little sweet, but also soggy...? It is really hard to write a review for those middle of the road ones. Not that they're bad books but yeah man it can be a challenge.